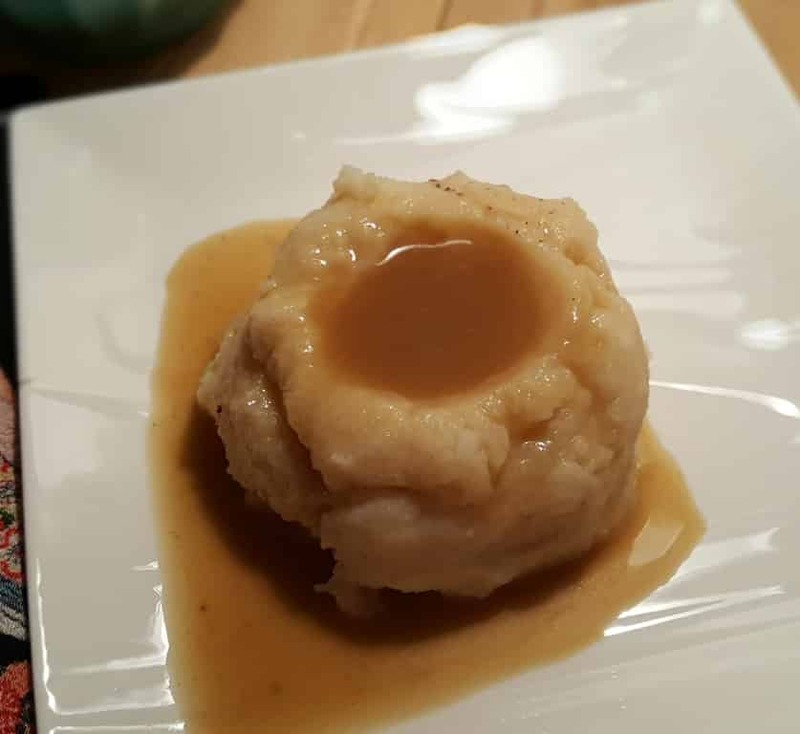 Asian Mashed Potatoes and Gravy is an Asian inspired mashed potatoes and gravy dish that can be made in the Instant Pot Pressure Cooker or on the stove. Mashed potatoes, no matter how you make them, always are so delicious. I’m not sure I met a mashed potato I did not like, so when I saw Angelin Goh’s Mashed Potatoes with Glistening Sauce, I was intrigued. As I read more, I discovered that Glistening Sauce is gravy. 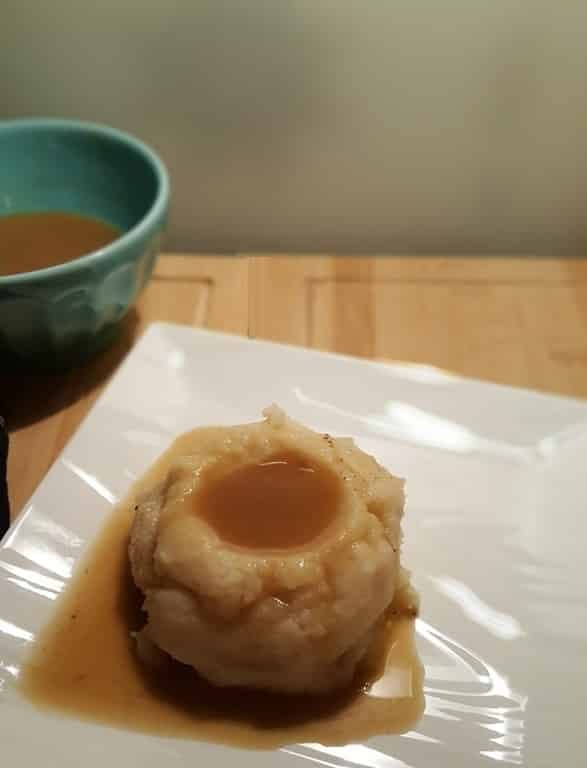 So, mashed potatoes and gravy, Asian style! 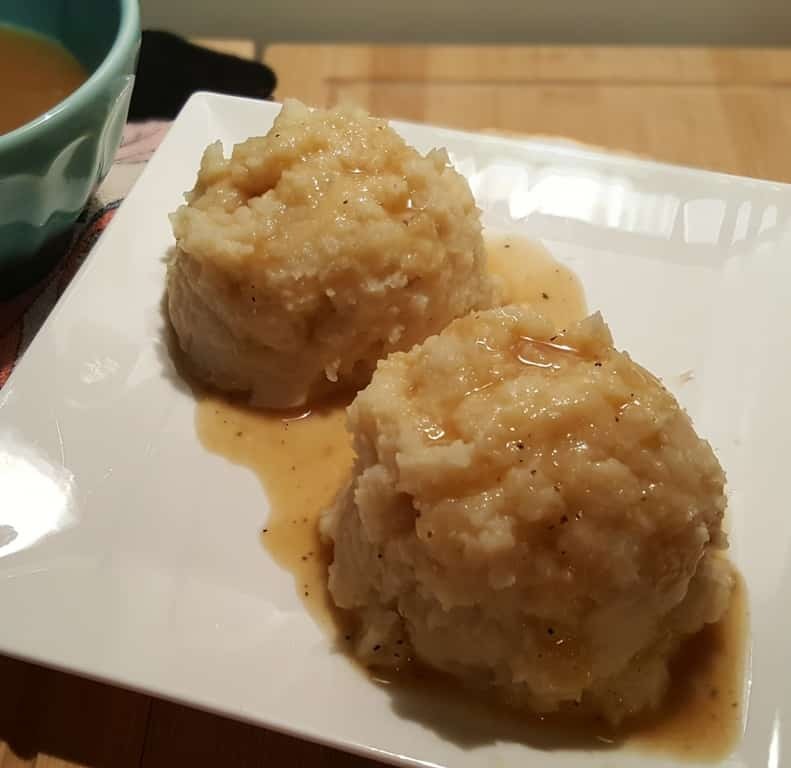 With the use of my Pressure Cooker, I knew that I could cook the potatoes and make the Glistening Sauce at the same time without worry about boiling water on a stove. Angelin loves to cook for her family and document her dishes. She has been so kind as to agree to do a special recipe post on my blog. In the mean time, I bring you Angelin’s Mashed Potatoes with Glistening Sauce. The Oyster Sauce is a brilliant idea! I always have jars of unsalted Bone Broth/Chicken Stock in my freezer, which makes everything taste so much better. I like to control the sodium in my food and making my own Bone Broth/Chicken Stock is a sure fire way. So, you will need to adjust the amount of salt you use, whether it be less or more, depending on your Bone Broth/Chicken Stock. Peel and quarter your potatoes. 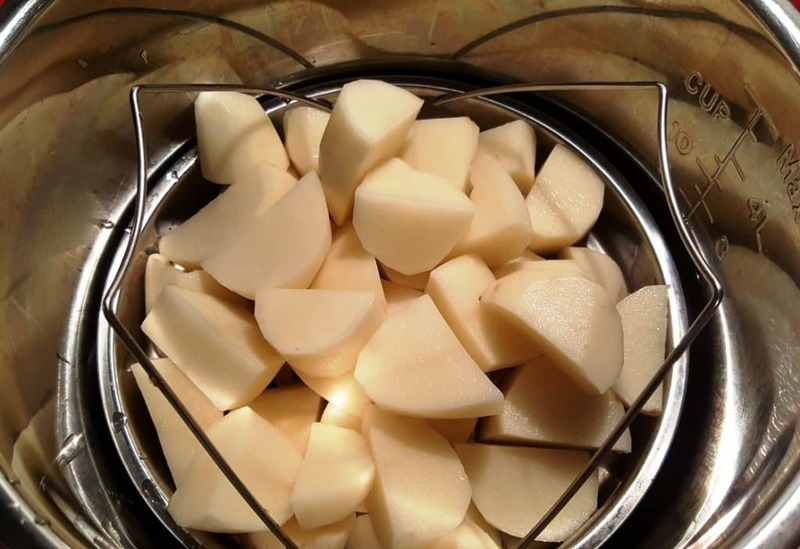 Since I am using a Pressure Cooker, I am able to steam my potatoes easily using a Steamer Basket. If you are using your stove top, cook the potatoes until soft. Steamed potatoes to me are so much better than boiling the potatoes in water. The potatoes retain all the flavor and don’t fall apart. 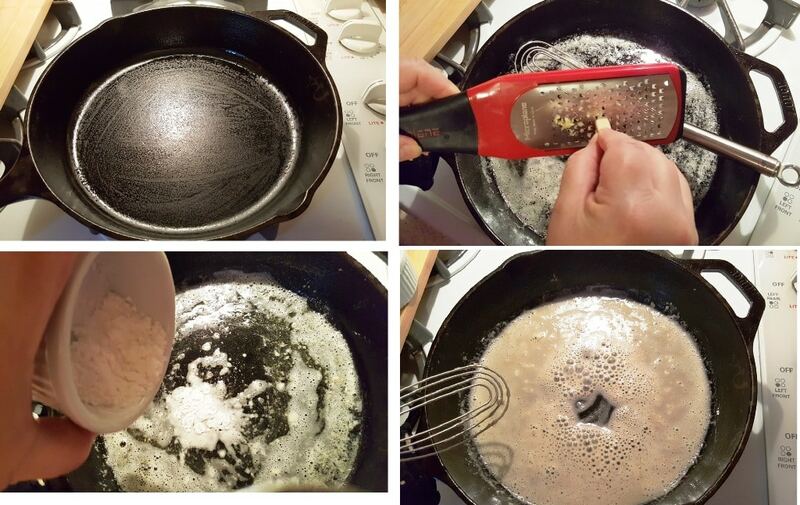 Heat up a Cast Iron Skillet until hot. Doing so, makes your Cast Iron Skillet non stick. This same method works for stainless steel. After the pan is hot, add the butter. If you chose to use garlic, grate the garlic right into the skillet, so that it will quickly cook, without having to stir and stir and stir. I can get to the next step quicker and I like the way the garlic infuses with the butter. I use a Microplane Artisan Fine Cheese Grater to grate the garlic. Add in your Potato Starch. 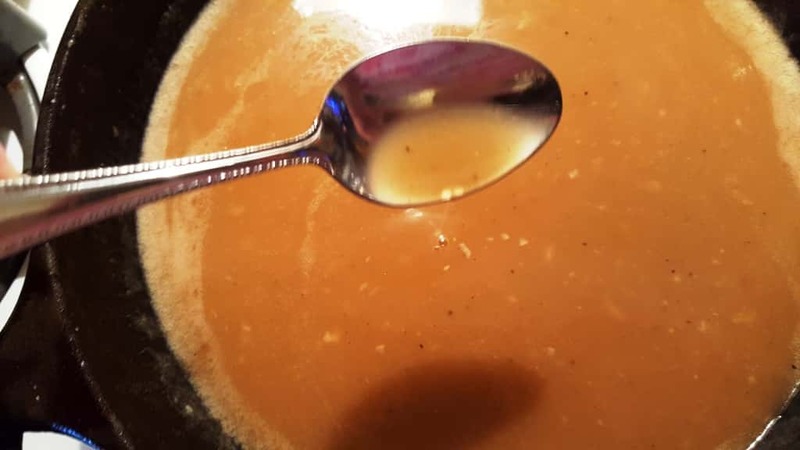 Angelin used flour in her recipe, but I prefer to use Potato Starch in my gravy, I mean “Glistening Sauce.” I love that….Glistening Sauce, don’t you? 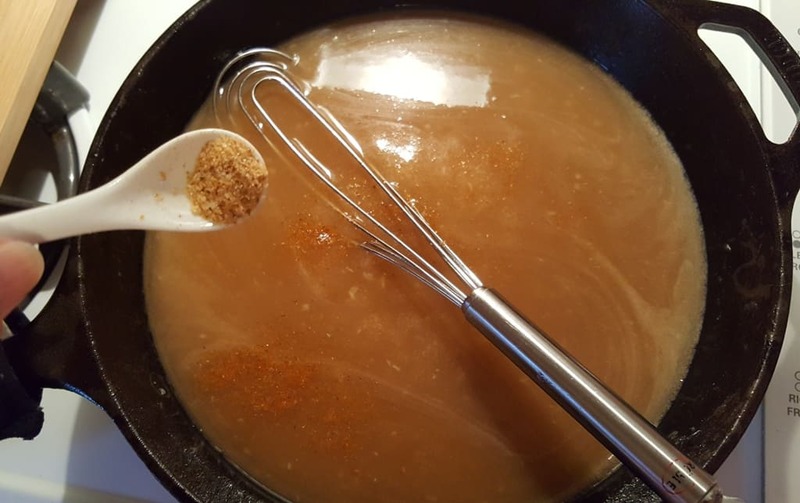 Whisk around the Potato Starch and butter to form a roux. Don’t stop whisking, as you don’t want clumps. 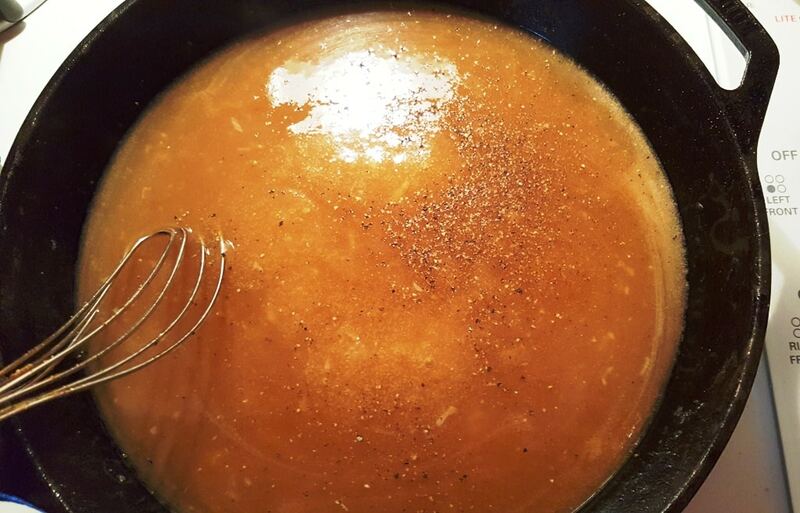 Whisk the Oyster Sauce into the Bone Broth/Chicken Stock and then pour it into the roux. Continue whisking as you want to thicken the sauce. Add some Italian Seasoning and whisk in well. If have a favorite seasoning, just use what you like. Lots of freshly grated black pepper, always give mashed potatoes a wonderful taste. Continue whisking until the sauce has thickened a bit. You don’t want a pudding consistency, just one that is thicker than water, kinda like blood. I’m just kidding, but that is what came to mind when I wrote that. Use either a potato masher or a fork and mash the potatoes. 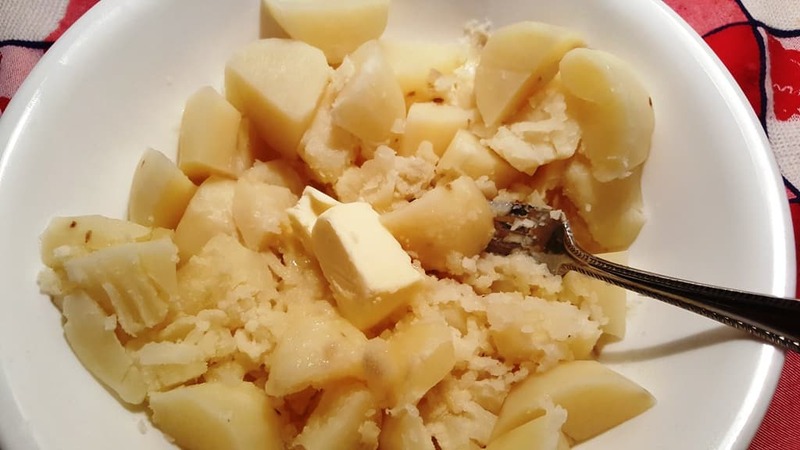 Add a chunk of butter to the hot potatoes and continue mashing. Angelin likes to make mounds and pour the sauce on top, which makes it Glisten, hence the name. You could always go the American way and make a well. 🙂 This pairs well with Soy Sauce Chicken Wings, Thighs, Legs recipe. If using a Pressure Cooker - Place 1 cup of water in Pressure Cooker cooking pot. 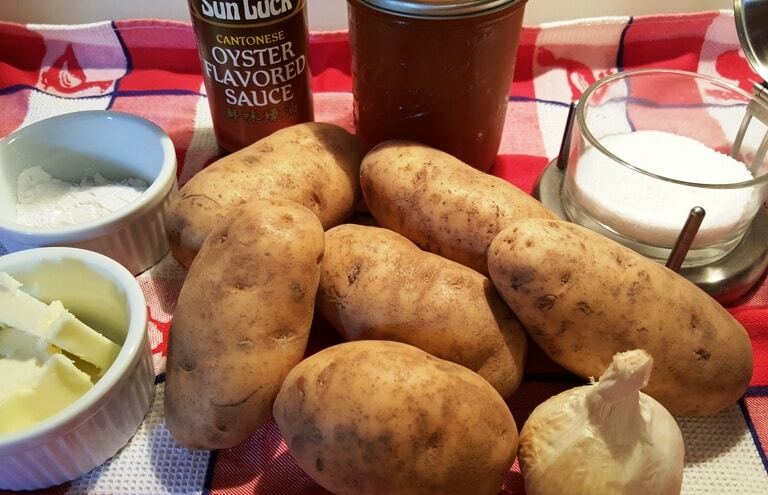 Add steamer basket with potatoes. Lock on lid and close Pressure Valve. Cook on High Pressure for 7 minutes. When beep sounds carefully release the pressure. 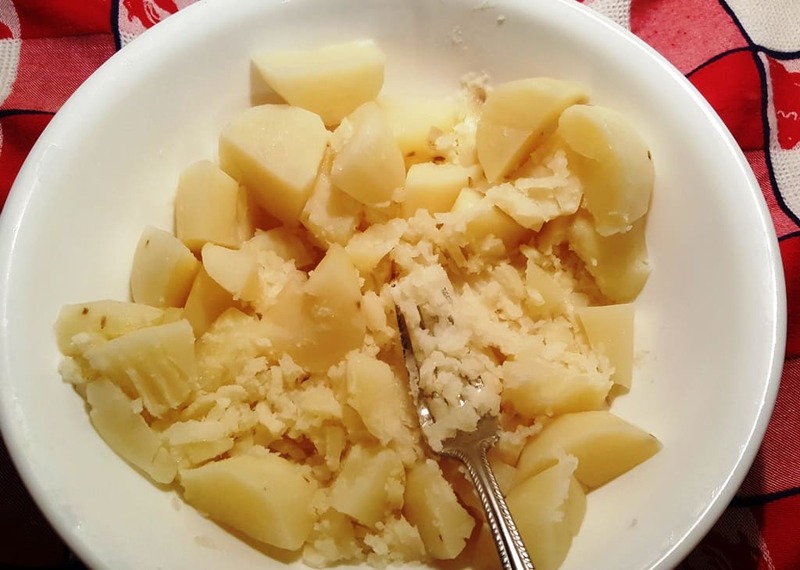 Place potatoes in a bowl and mash. Add butter and continue to mash. Slowly whisk in the Potato Starch and whisk until smooth. 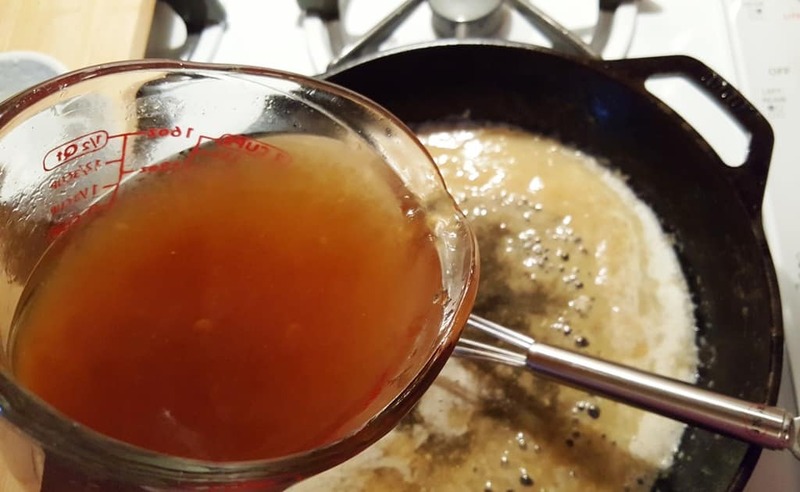 Add oyster sauce and salt (if using) to your Chicken Stock and then slowly pour into the roux, continuing to whisk. Add the Italian Seasoning and Pepper and whisk until desired thickness. PIN this Pressure Cooker Mashed Potatoes with Glistening Sauce (Gravy)!